We love to have at least one night a week at our house where we do not eat meat. But going without meat does not have to mean that your meals are boring. This Vegetarian pizza was a huge hit when I served it the other night. 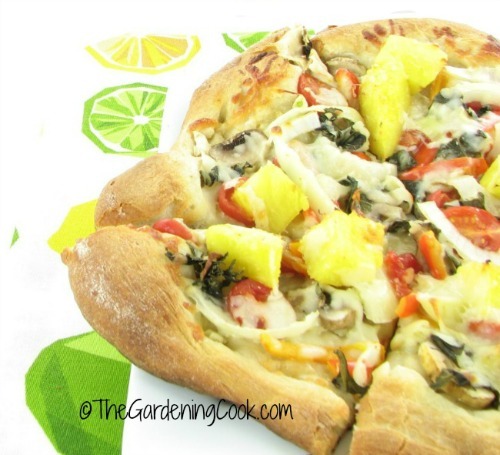 This Vegetarian Pizza is perfect for Meatless Monday. I love making meals with no meat in them at least a few times a week. 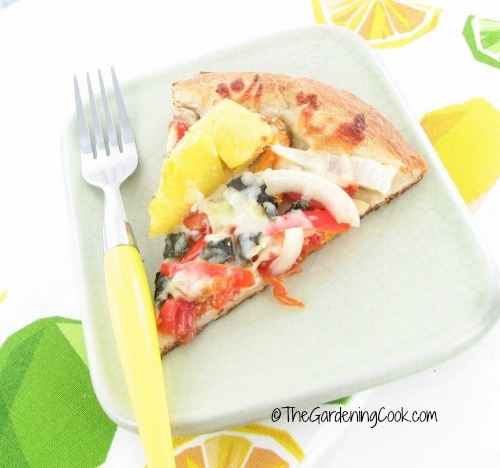 This vegetarian pizza is my latest recipe. I have long grown tired of the traditional red sauce pizza. I used to love them, but now, they just don’t taste right to me. I even went totally off pizza for a while. But after a trip to Lilly’s Pizza with my daughter and trying their garlic and olive oil based pizza, I am hooked on pizza again! The pizza starts with refrigerated pizza dough and then it is spread with a mixture of olive oil and chopped fresh garlic. Add on the veggies. 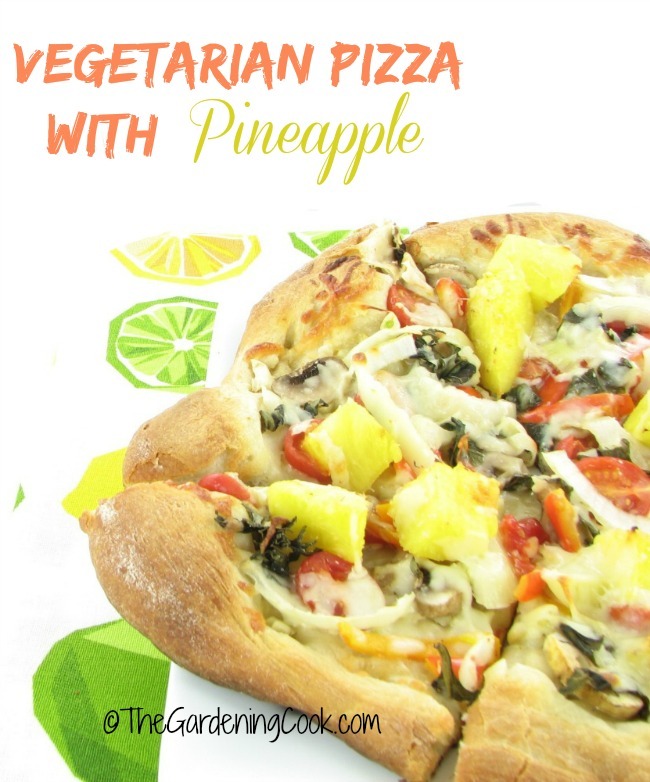 You can add whatever you like but for this recipe, I used grape tomatoes, sweet peppers, onions, fresh basil and fresh pineapple chunks. I added the cheese next. It does not need a lot of cheese. I used mozzarella to stay with the “white pizza” look. Into a preheated 425º F oven for about 15 minutes. Easy peasy! Perfect for a busy week night. Another tip! For a perfectly cooked pizza crust, try baking smaller individual pizzas on a silicone baking mat. It cooks the crust perfectly and clean up is a breeze with just soap and water. Who says vegetarian recipes are boring? My husband is an avid meat eater and loved this pizza. It is chock full of nutrients, much lower in calories then the ordinary meat pizza with a ton of cheese but still has a load of flavor. And it is it pretty on the eyes too! 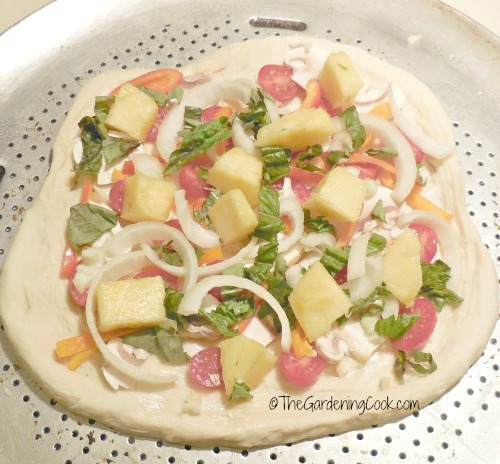 Preheat the oven to 450º F. Form your pizza crust into the shape that you would like. Combine the olive oil and minced garlic and spread it over the pizza base. 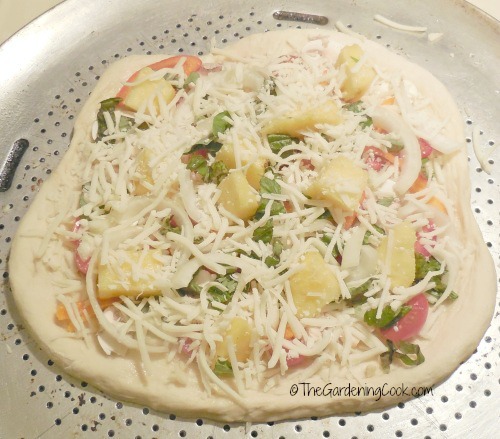 Spread your pizza toppings over the pizza base and top with the shredded cheese and sliced basil. Cook in a preheated oven for 14-15 minutes until the crust is lightly browned.